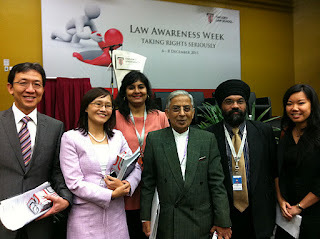 On 6th December, 2011, the Secretary of AWL, Ms Goh Siu Lin, delivered a speech to the students of Taylor's University on "Women's Rights" in her capacity as Secretary of AWL. Mr. Christopher Leong (Vice-President of the Bar Council) officiated the Opening Ceremony of the Law Awareness Week and spoke on "The Right to a Fair Trial". The other speaker was Emeritus Prof. Datuk Dr. Shad Saleem Faruqi (Senior Professor of Law & Legal Advisor, University Teknologi MARA) who spoke on "The Right to Counsel in Malaysia". Following this, AWL had set up booth on the 7th of December and successfully recruited 12 new associate members from the Law students.